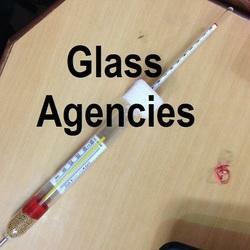 Glass Agencies EROSE are manufacturer of Brix Hydrometer. Brix Hydrometers are used in sugar industry. Brix Thermohydrometers or Bsix combo comprises of thermometer inbuilt along with hydrometer to measure temperature also. Temp Range: o'c w so'c. We are offering Brix Hydrometer to our client. 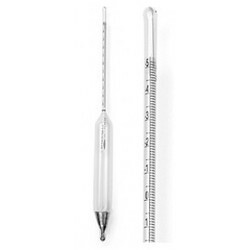 Since our establishment, we have become the well-known manufacturer and supplier of Jawa Brix Hydrometers. We have carved a niche amongst the most dominant names in this domain, instrumental in providing superb quality range of Brix Hydrometer. We are the prominent company in offering Brix Hydrometer to our clients. This product is stringently tested on certain parameters to eradicate all kind of defect before delivering at clients' end. Brix Hydrometer is widely known for various attributes like light weight, compact and ultra sleek design and many more. One can buy from us best assortment of Brix Density Hydrometers. This is manufactured adhering by the quality standards of the market. We have emerged as one of the foremost firms, engaged in offering a comprehensive range of Brix Hydrometer. We have become one of the renowned companies of Brix Thermometer. Our product is extremely admired by patrons owing to their longer life service.